Product prices and availability are accurate as of 2019-02-27 23:55:52 UTC and are subject to change. Any price and availability information displayed on http://www.amazon.com/ at the time of purchase will apply to the purchase of this product. 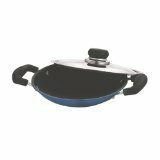 Appam pan with lid - appachetty with lid, 3 Cost ceramic reinforced right through, 3.00mm extra thick aluminum for even cooking, consumes less gas, easy to clean, 200mm with steel lid, PFOA Free, Swiss Quality. Premier Non-Stick Cookware are manufactured in conformation with stringent quality norms to make them consistent with the highest international quality standards for non-stick cookware manufactured anywhere in the world. International specialists and pioneer in the concept of non-stick cookware conduct quality assessments of Vinod Non-Stick Cookware Units. To the consumer this represents the ultimate certification of Vinod quality and provides them the reassurance that both the coating and the cookware are truly world class. Non-stick cookware are made of 99.5% purity aluminum metal as the product base with strict adherence to quality control in all the stage of the production. The non-stick coating is done with internationally known and approved materials with all imported from SWISS. The base and the non-stick coatings are thoroughly quality approved as conforming to the international standards. Multi-coated elegance, Vinod Non-Stick Cookware the undeniable jewel in any modern kitchen. Packing are also offered as individuals, set packing, gift/presentation sets etc.